About 20 years ago my wife Priscilla brought back from Nigeria about 40 albums of Ijaw (Izon)-language highlife music, or Awigiri, from the Niger Delta that she'd gotten at a used record store in Lagos. Of course, I knew Igbo-language highlife from eastern Nigeria, but this was totally unfamiliar to me. I'll admit that I didn't warm to it immediately. I devoted a Likembe post to this music ten years ago, but apart from a few cursory listens these records have mostly sat on my shelf since I got them. Recently, though, I decided that I would sit down and sytematically digitize every single Ijaw record that I have. For the past few weeks I've been immersing myself in Awigiri, and it's a revelation! I've realized that I wasn't giving this stuff a fair hearing. I had been listening to it in reference to other styles I was more familiar with, but Awigiri must be accepted on its own terms! 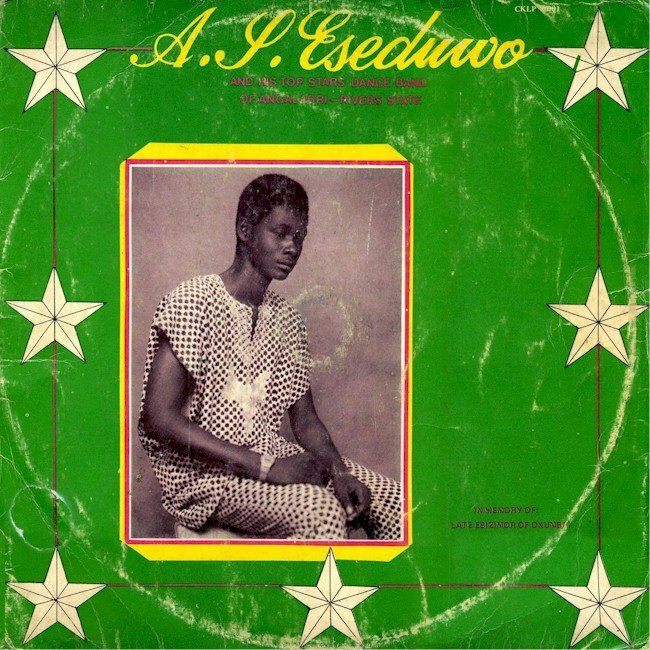 Musically Awigiri has more in common with the minor-key sounds of Ghana highlife than other Nigerian styles. 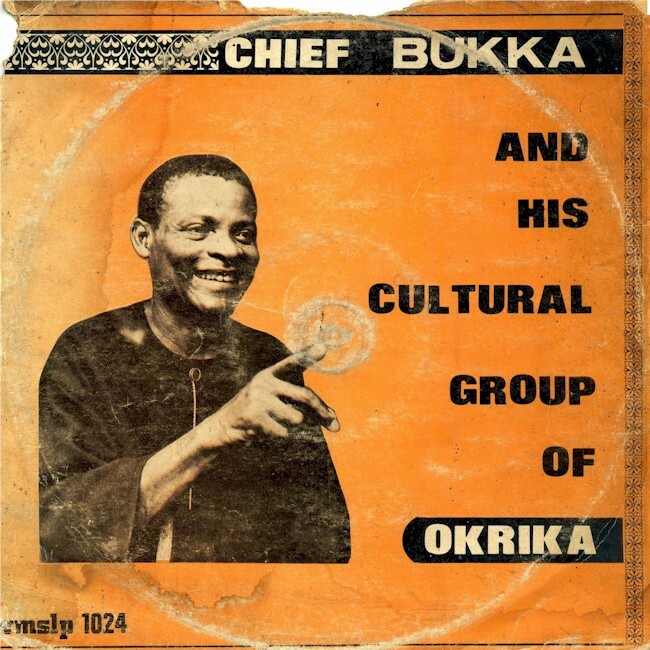 It certainly lacks the immediate punch of the music of Nigerian highlife legends Warrior or the Ikenga Super Stars, or the sophisticated arrangements of Chief Stephen Osadebe. It's a guitar and percussion-based music that comes at you in a more subtle, roundabout way, but delivers big time. Take today's musical selection, Edogbo Special Vol. 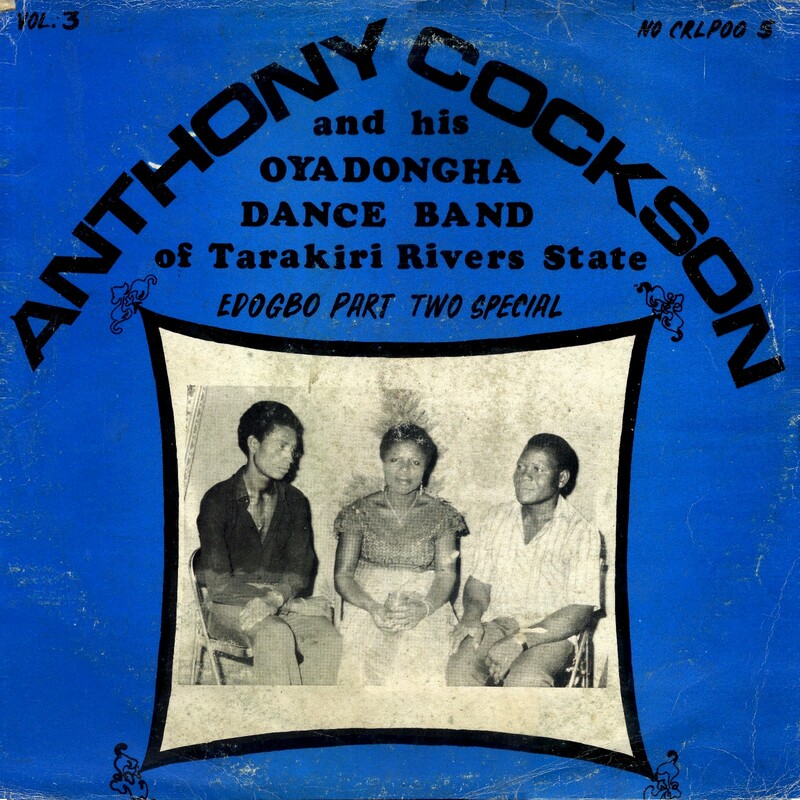 2, by Anthony Cockson and his Oyadongha Dance Band (Cockson Records CRLP 005, 1986). 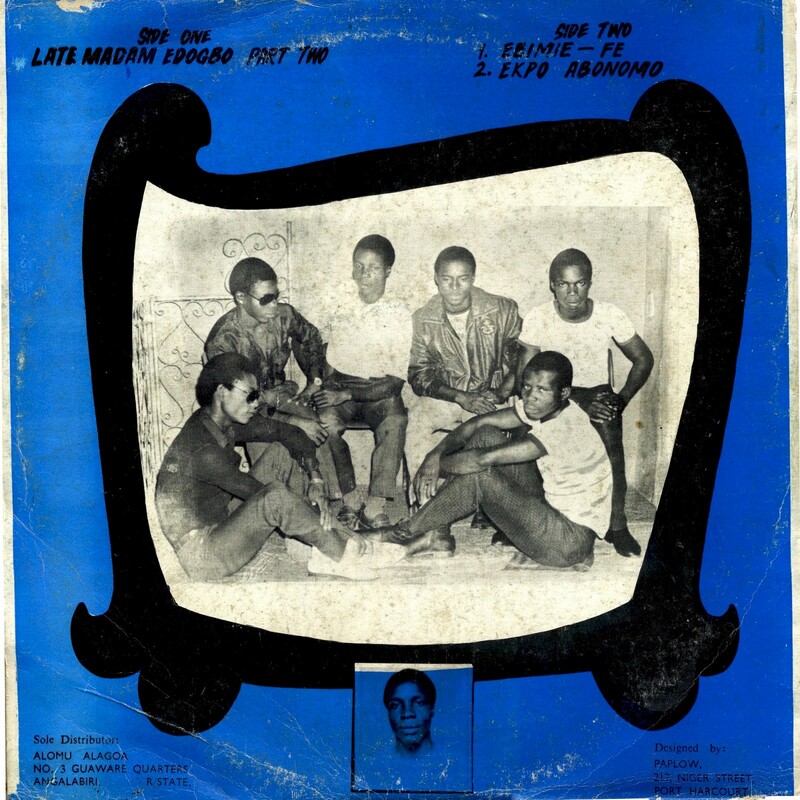 That previous Likembe post featured an outstanding tune by them, "Late Brother Iddo," from Edogbo Special Vol. 1 (Cockson Records CRLP 001, 1984). 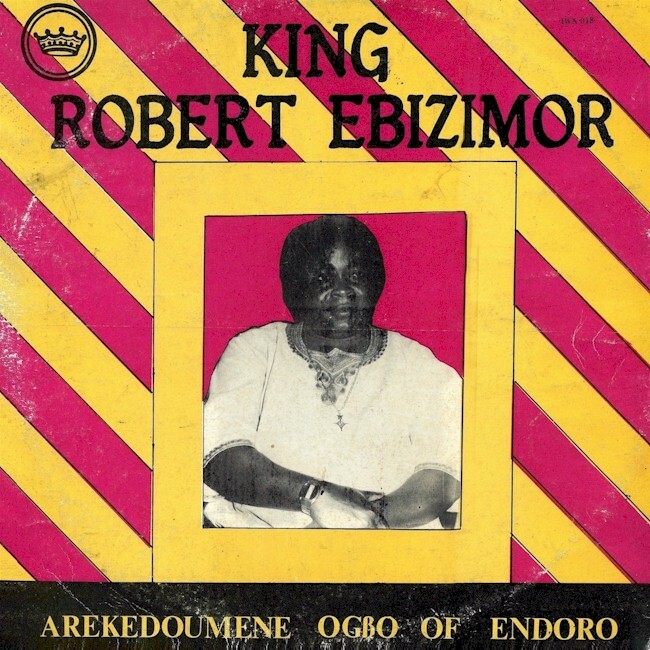 The title tracks of both albums are tributes to Mr. Cockson's late mother Madam Edogbo Perefa. Here the band is firing on all cylinders; the guitar work in particular is spectacular. The musicians on Vol. 2 aren't credited, but I would assume they are the same as on Vol. 1. 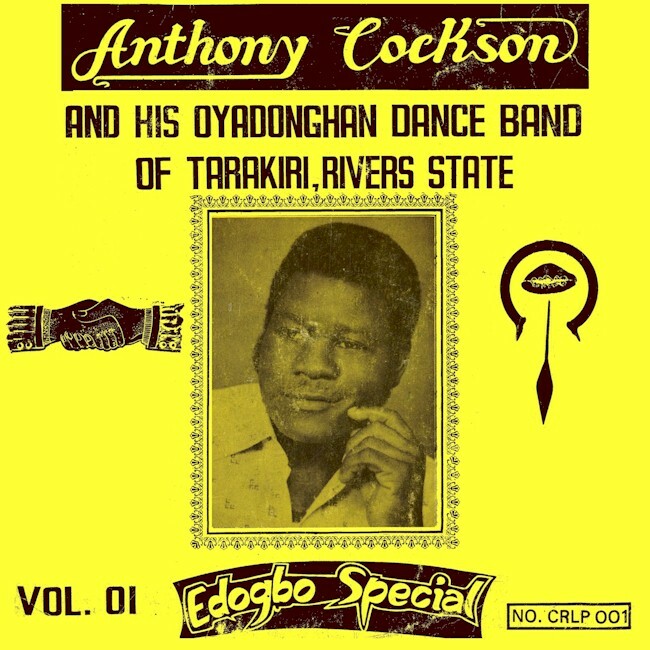 These are Mr. Cockson on vocals, Sayerigha on lead guitar, Paa Pee on bass and Free on rhythm guitar, Dare Saturday on drums, Ogbo-Akedei Zitare on clips, A. Lucky on maraccas and P. Timi-Ebe on congas. 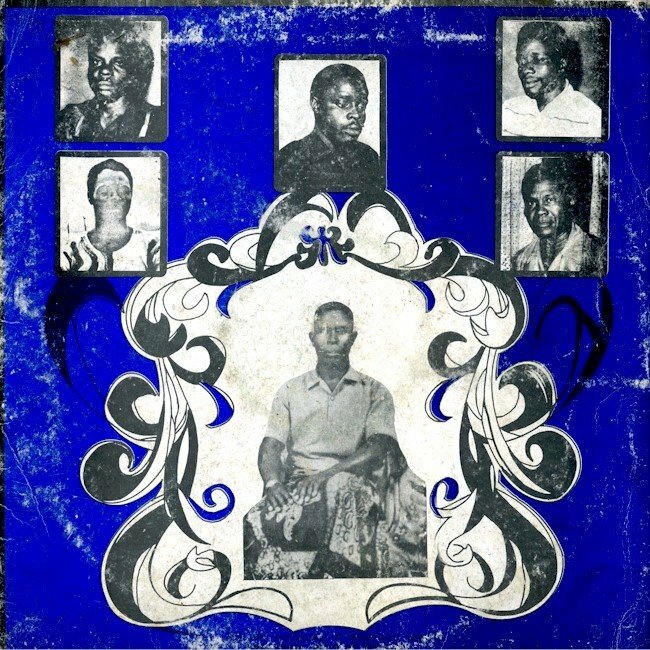 Ubulujaja over at the Highlife Turntable blog is also into Ijaw highlife and posts it often. He's been in touch with the son of Bestman Doupere, another well-known musician from the Delta, who relates that Mr. Cockson, Mr. Doupere and another musician named King Ebizimor were all from Sagbama in present-day Bayelsa State and played together before they all embarked on solo careers. I plan to post music by these musicians and others from the area in the future. Download Edogbo Special Vol. 2 as a zipped file here. A while back I did a post devoted to awigiri, the highlife music of the Ijaw (Izon) people of the Niger Delta. I have quite a few LPs of this particular genre, and I've been digitizing them in preparation for a future post, or series of posts. In the process this particular album, Late Chief Ohbobo Special (Success SSLP 027) really caught my attention and I thought it was worth posting in full. 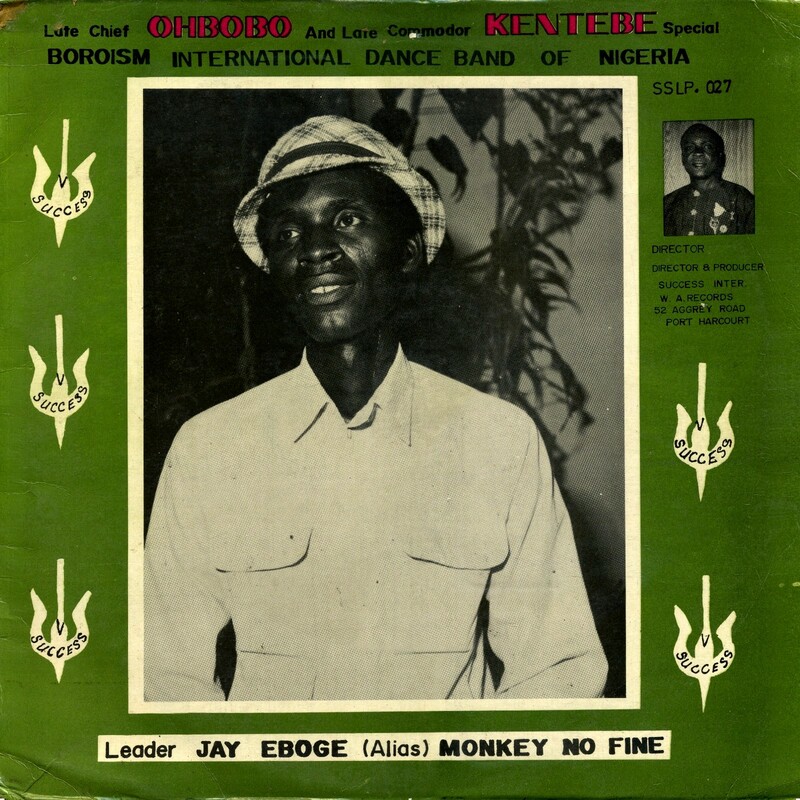 I know absolutely nothing about the Boroism International Dance Band of Nigeria or its leader, Jay Eboge - "Monkey No Fine." I assume the group takes its name from Isaac Adaka Boro, who led a twelve-day armed uprising against the Nigerian and Eastern Nigerian governements in 1966. He was subsequently jailed, then amnestied on the eve of the Biafran war of independence in 1967. He died fighting for the Nigerian Federal Government in 1968 under what are described as "mysterious" circumstances and is a hero to Niger Delta indegenes. I particularly enjoy the saxophone work on this album by a musician credited only as "Boma." I hope you'll enjoy it also. Download Late Chief Ohbobo Special as a zipped file here. The Ijaw people, who number close to ten million people, are the fourth largest nationality in Nigeria. They are a majority in Bayelsa State and constitute large minorities in Rivers and Delta States. Ijaws have a long history of resistance against various central governments. Under British colonial rule this took the form of agitation for a separate Ijaw-majority "Rivers State," and this advocacy continued following independence in 196o. 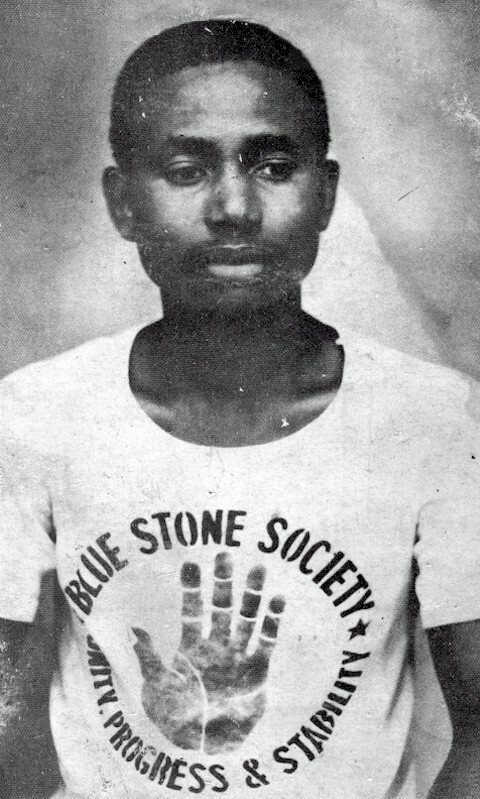 In 1966 Isaac Jasper Adaka Boro led an armed rebellion against the governments of Nigeria and the Eastern Region, declaring a Niger Delta Republic on February 23 of that year. When it was suppressed after twelve days, Boro was jailed, only to be pardoned in May 1967 on the outbreak of the Biafran war of independence. Boro fought on the side of the Federal government in that conflict and died a year later in battle near Okrika. The creation of Rivers State in 1967, separating it from the old Eastern Region, delivered a death-blow to the nascent Biafran Republic, rallying the Ijaws and other nationalities of the Delta to the side of the Federal government. 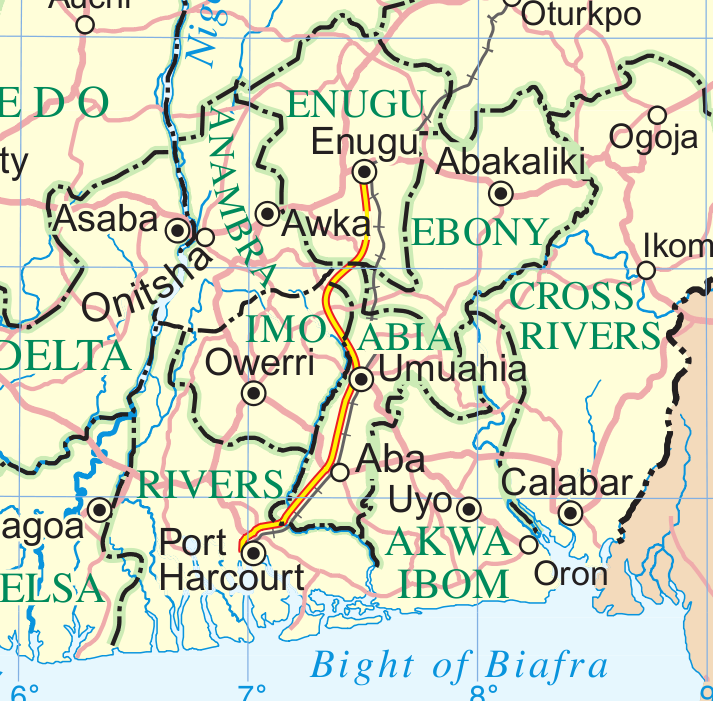 Bayelsa was carved out of Rivers State in 1996. In recent years Ijaw youths have taken up arms against the government to demand a bigger share of the oil revenue which comes from facilities in the Niger Delta. 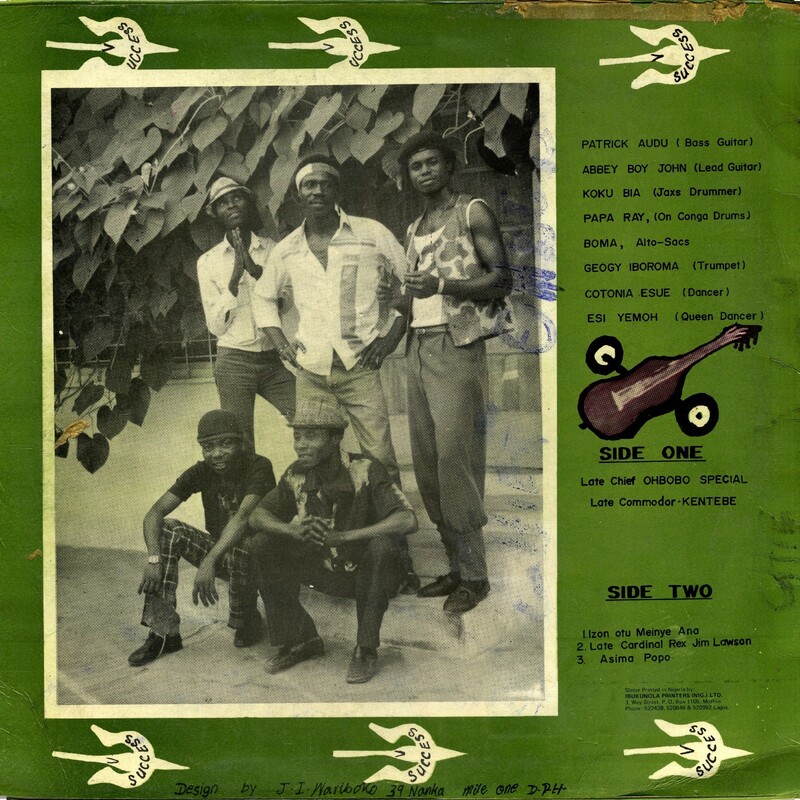 The Ijaw have their own indigenous form of highlife music, called awigiri. It is almost completely unknown outside of Nigeria, but has produced many popular musicians and recordings over the years. In a recent post I featured a song by Ijaw musician Peanock Timibi, and a further exploration of this music seemed like a good idea. Barrister S. Smooth of Enekorogha, Delta State has a number of videos on the internet, including this one. 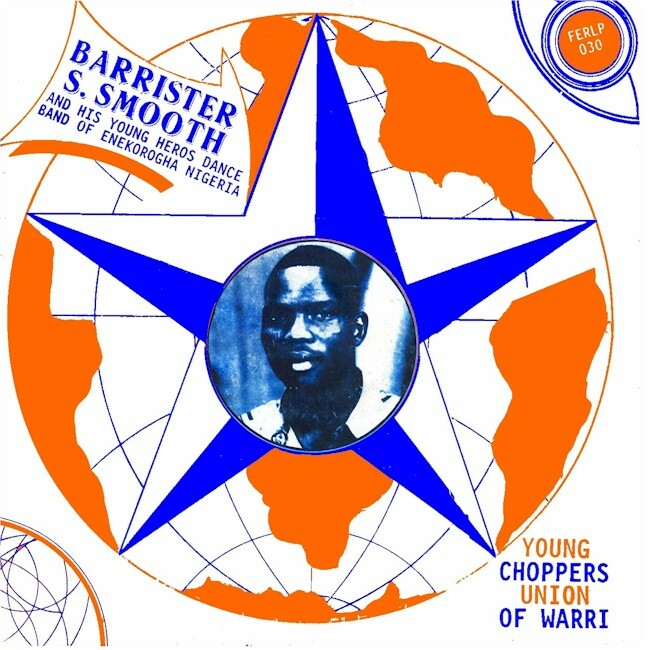 "Seikeme Tabbe Bofa Ekpe" is taken from the album Young Choppers Union of Warri (Felix FERLP 030, 1991), apparently a tribute to an all-women's charitable society. Don't you just love that title? By the way, the picture at the top of the post is apropos of nothing in particular. I just took it off the back of one of these albums and thought it was cool. Uchenna over at With Comb and Razor posts a song by Uyo-based band Sunny Risky and the Vitamin Explosions, which he says is the "Best. Band Name. Ever." I agree, that's a pretty awesome appellation. In fact, the only band name that I can think of that comes close is Brother Charlly Computer and The Gloria Kings. 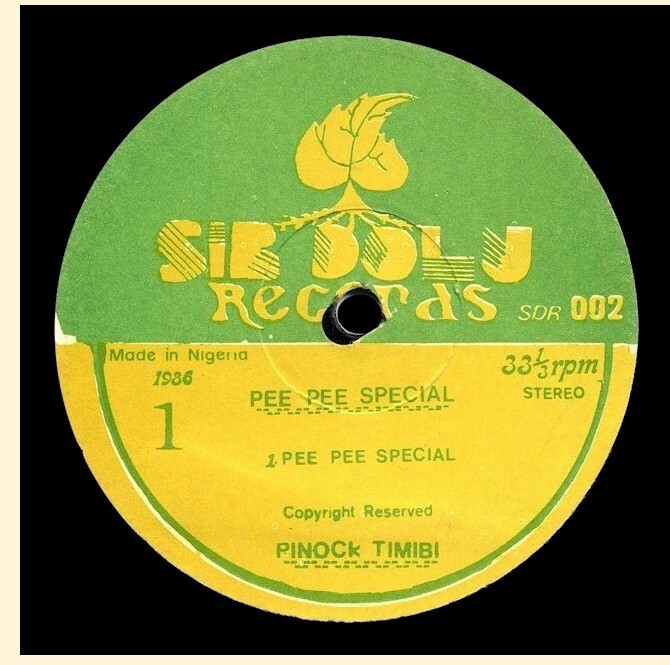 Which got me to thinking about peculiar and/or unintentionally humorous band names and album titles, including the one at the top of this post, Pee Pee Special, by P.T. 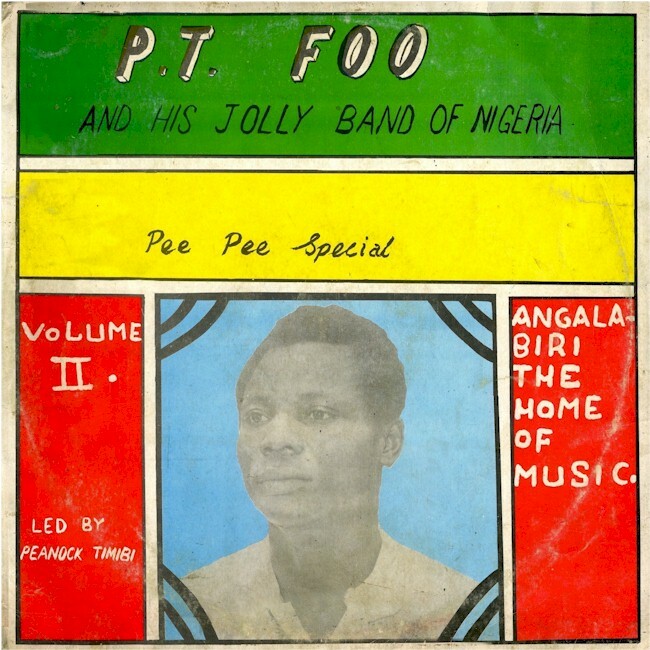 Foo and His Jolly Band of Nigeria (Sir Dolu Records SDR 002, 1986). Mr. Foo (Peanock Timibi) is an Ijaw musician from Bayelsa State in the Niger Delta, which has been the scene of much unrest in recent years. I will confess that I have listened to the records featured in this post maybe once in the ten or twelve years since Priscilla and I feretted them out of a used-records store in Ajegunle, the "Eastern" ghetto of Lagos. The musicians here are not well-known, even in Nigeria, nor even the most professional. What they lack in polish, though, they more than make up for in sheer, sloppy exuberance. They may be "no-hit wonders" but they're going to make the most of it! The Efik, Ibibio and Annang ethnic groups, who speak closely related languages, comprise about 3½ million people in the southeastern corner of Nigeria. No doubt there is a lively music scene in this area, but I'm not very familiar with it outside of the 4-5 LPs in my collection. Like Sunny Risky & the Vitamin Explosions, U.T. Isenem & his Black Mirrors are an Ibibio group. Their name qualifies them for attention in this post - what good would a "Black Mirror" do you?